For years, the stereotype of the father who is essentially just another child in the home has been a favorite on television shows and in movies. This really hasn’t been of service to fathers nor to families. Fathers are more than clumsy, dopey, large, children. The truth is, fatherhood is a sacred role. It is an important role. We all need to treat it as such, for the sake of our children, our families, and our fathers. Here is the surprising truth: most dads feel inadequate. I asked my husband for feedback in creating this post, and as we talked, he told me that he has noticed that whenever the subject of fatherhood comes up, in church or among friends, most men comment on their feelings of inadequacy. We all acknowledge women’s insecurities as mothers, but we don’t acknowledge the same for men. Men feel like they mess up a lot. They also feel apprehensive and/or lack confidence in the role of father. We as mothers can completely relate to that, right? Who felt fully prepared to be a mom? I know I didn’t! Something we women have as an advantage in the parent department is that even working moms get a period of time to just practice. When we have a baby, we dive in the deep end head first, whether or not we have even had swimming lessons. We somehow learn how to stay afloat–even if we often feel water-logged. We get LOTS of time for figuring things out. We pretty much have a 24 hour a day, 7 day a week on-the-job training. Dads, on the other hand, typically are back to work soon after the baby is born. When they do get time to be “Dad,” they usually have Mom right there. They have very little time to be alone with baby and get some trial and error time in to figure out the dad thing. When my husband said men felt inadequate as dads, I pressed for more details, because I don’t see that in men. I clearly see women feeling a lack of confidence and questioning themselves, but I don’t see that from men. This I have seen! I recently saw a list of things men should do with paternity leave (since that is happily becoming more of a thing these days). I can’t remember where the list was or what was on it other than one thing. It was that dads, paternity leave is not designed for you to build a chicken coop. The point was, don’t go work on a project, help around the house and help with the baby. I think we look at paternity leave as for the mom’s benefit. That absolutely has value. 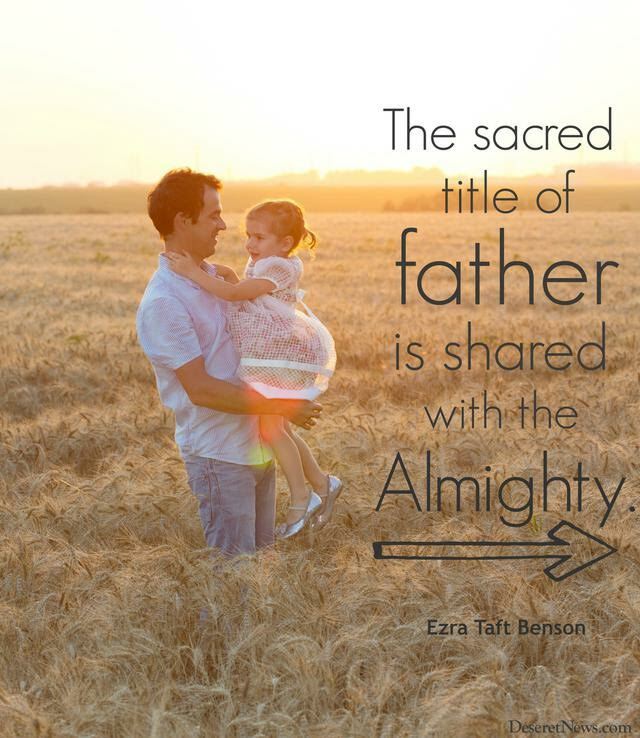 But I think we can and should also look at it as a benefit to the father/child relationship. This is a time a father should be able to spend some time figuring out being a father. But what do dads often do after a baby is born? I know I have commented before, and clearly from this list I read it is a common trend, but they take on a project! Dad wants to help the family in some way, but he feels like he can’t contribute in a correct way to the baby, so he starts a project. Men don’t withdraw as fathers because they don’t like the child or because they don’t want to be helpful. They do it because they feel inadequate and don’t know how to fix that. It must be said, obviously not all men feel inadequate. Some jump right in with confidence! But many just aren’t sure what they should be doing. 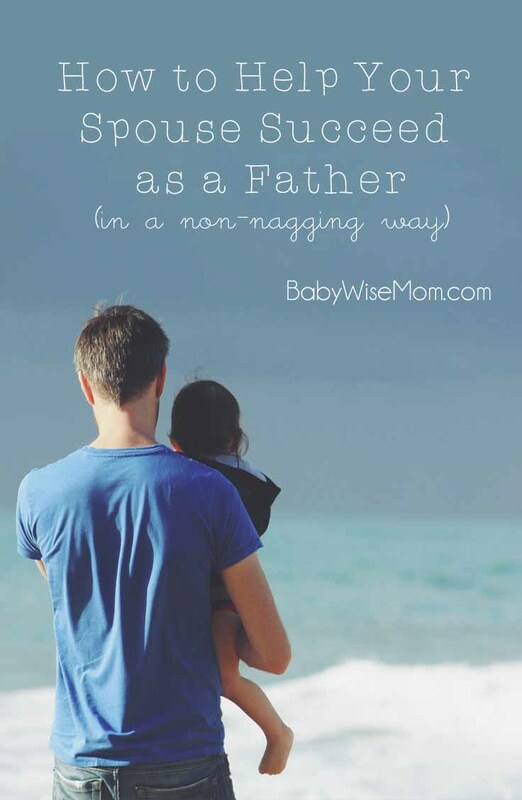 With that all said, here are some ways you can help your husband to be a the best father he can be without being a nag. No one likes a nag. 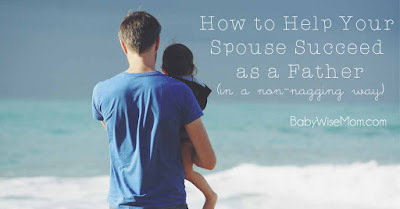 My husband said the number one way to help your husband be a better father is to encourage him in that role. My husband is a huge proponent of positive reinforcement. Encourage the positive and your husband will rise to that and then some. No matter the age of your child(ren), you can help facilitate special time with the father/child. In most cases, mom tracks and keeps the schedule (I know this isn’t true in all relationships, but it is true in most). For the babies, brainstorm for a way your husband can be involved in the baby’s life and care on a regular basis. Talk to your husband and see how he would like to be more involved. Give him ideas for what he can do (this is especially helpful if you are breastfeeding). You can have a time of day set aside for your husband to read a story to the baby (babies can be read to from birth). Your husband could do bedtime. Your husband could change all diapers when he is home. He could be in charge of bathtime. If you have a bottle feeding, dad can do a feeding. Many couples have dad be in charge of the dreamfeed and have that be a bottle feeding even if breastfeeding (you can use expressed milk). It gets easier with toddlers. For us, as soon as our babies turned one and stopped breastfeeding, my husband became 100% in charge of that little one for bedtime. He got the toddler ready for bed, read stories, said prayers, tucked in, etc. This turning point has always been a big change in helping the children develop a close bond with dad. Once a new baby turned one, then my husband took bedtime for that one and then bedtime for the older ones was more of a “we” thing for the older kids. By then, a strong bond had been established. With children two and up, you can have weekly or monthly dates that are one on one. You two can choose a day that will work and your husband can plan something to do. It can be simple. For Brinley and Nate last year, all but one of their dates the entire year was going to the duck pond down the road and feeding ducks. Brinley loved it (and still does). When Brayden was born and my husband retreated, I thought he regretted the decision to have a baby. I literally could count on one hand the number of diapers he changed in the first 6 months of Brayden’s life. He became more involved as Brayden got older, and by the time Brayden was a pretoddler, they were little buddies. When Brayden was just over a year, every day as soon as Nate got home, he took Nate’s “hand” (but all he could grasp was a finger) and led him to the sandbox. I remember little 18 month old Brayden helping Nate remodel our master bedroom. He was always right behind him with his own little lawn mower on lawn-mowing day. They were pals. Then Kaitlyn was born and he was still involved with Brayden (probably even more so than before Kaitlyn was born), but not involved with the baby again. I then decided he must not like babies (and truth be told, he isn’t a huge baby person. Men have stage preferences just like women do). Before McKenna was born, we talked things out. I was about to have three children 3 and younger and I knew I needed a bit more help this time around. I outlined what I hoped to get from him. He explained why he hadn’t been more involved in the past. Having an open conversation of what we would each like to see happen was so very helpful. Communicate openly, not just in your head. You can both explain why you do what you do and what you hope to have happen. When Brinley came, he got some form paternity leave (not true paternity leave, but some time) and he didn’t use it to create a big project! He used it to help at home and to spend time with our new little addition. When Brayden was a baby, my husband was in school full time and working full time. He was gone before we woke up and he didn’t return until after 8-9 pm most days. Because of that, I made Brayden’s bedtime after 9 pm. GASP! Me. I know. Because of this late bedtime, Brayden had a third nap until he was 10-11 months old. A way to get him to a later bedtime was to continue to have a third nap for a long time. Right around Brayden’s first birthday, my husband graduated and got a job with normal predictable hours. When that happened, we moved bedtime to the ideal 7 PM hour. He moved just fine without issues. You can arrange your schedule so that there can be a father/child relationship that is nurtured. Figure out what is best for your family. If your baby just can’t handle a situation like that, then try to think of different ways to make sure that relationship is nurtured. Maybe weekends will be your time. Dads can do some things that seem weird and/or crazy to moms. Dads throw babies high in the air. Dads wrestle (and usually they do this right at bedtime). Dads are often “fun” and let the routine go out the window when in charge. We can get jealous of that at times. We want to be fun, too. We can work in some fun on our own without taking away the fun from dads. Allow that seemingly quirky role fathers play to happen. With that said, that doesn’t mean you don’t need to shoot the “okay this thirty minute pillow fight at bedtime has gone on long enough and now it is time for bed” look his way from time to time :). Children need dads to be natural dads. They don’t need your husband to be a second you. They need you two to be unique and yet united. Always keep the communication open. At times, we moms get to a breaking point where we feel like we can’t take any more. We usually push past that point in an effort to be tough or to not complain. Then we do break down and things aren’t pretty. It is much more effective to be humble and realize, I am about to break down. Let your husband know at that point and tell him what he can do to help you avoid the breakdown. I did this just a week ago! We are doing an addition on our home, and for several weeks, I was parenting pretty solo. Bedtime was alone each night. All children and house duties were up to me. The kids were missing their dad. Then last week I had a super busy week (the end of the school year is totally crazy). I was gone from the house almost all day each day of the week. Needless to say, the house went downhill. The straw was that the exterminator was coming Thursday. I like to have things cleaned up and moved away from the walls when the exterminator comes. I was in very deep water and didn’t think I would have time to get things cleaned up, much less moved out. I called my husband as he left work and told him I was at my breaking point and that I needed help. He came home, spent only 30 minutes with me helping me get things ready, and completely helped lift that stress off of me. Things weren’t perfect like I like for the exterminator, but they were good enough and I felt much better. So be open. Let your husband jump in and help before you break apart. Men like to solve the problem, so let them know before it is too late. Be sure to fill your husband in on the children, also. Let him know what is going on in their lives, from baby on through all ages. Moms often get more time to communicate and spend with the kids, so you filling him in is very helpful in him knowing what he can do as a father to help the kids out. Another great idea Nate and I want to implement is a weekly progress report. A companionship council. Take an inventory. We plan to do this each Sunday night. The idea is to discuss molehills before they become mountains. It is to tell each other what is going well. Share what could be improved (without getting defensive!). Talk about your relationship. Talk about the children’s emotional, physical, and spiritual needs. These are six actionable ways to help your husband be the best father he can be. Be encouraging. Treat him how you want to be treated–with respect and love. 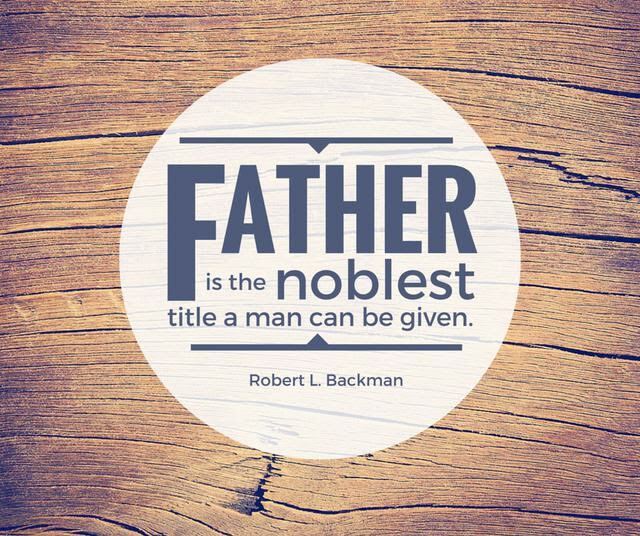 Recognize the importance of his role as a father. The ladies of the BFBN are all talking about fathers today. Be sure to check them out today.